That's all that remains of the NBA regular season, but yet so much is still unsettled. Seeds in both conference are up for grabs. Multiple teams outside of the playoff picture can find a way in. The matchups can change on a daily basis. Brace Hemmelgarn/USA TODAY Sports Will the Pacers revive and put on a good show in challenging the Heat for the East's No. 1 seed? Plot summary: The Eastern Conference's top seed and home-court advantage until the NBA Finals is at stake. Miami leads Indiana by one game. horror movies in which a car breaks down in the middle of nowhere: Indiana has had nothing in the tank since the All-Star break, and you better believe the big bad monster of the East smells blood. Spoiler alert: The Heat and Pacers will go heads up on April 11 in the most critical regular-season game of the year for both teams. The Pacers would own the tiebreaker with a win, but a loss would even the season series at 2-2. The Heat would own the next tiebreaker (winning percentage against division teams) with a win over the Atlanta Hawks or Washington Wizards, or a Pacers loss to the Milwaukee Bucks. Watchability (out of five stars): 3½ stars. If Indiana stumbles at all (and no one can run in horror movies), this could be over rather quickly. Home court and extra rest aren't something LeBron James & Co. are liable to take for granted. Plot summary: The battle of attrition for the 8-seed wages on. Atlanta leads by two games, but by virtue of owning the tiebreaker via the season series (2-1 ATL), it's essentially a three-game lead. dark comedy: The Knicks have long mixed soul-sucking losses with shoe-untying hijinx, and now in a well-teased close to the season, Carmelo Anthony will be dealing with a "dead arm" from shooting so much. Spoiler alert: The red herring here is the Hawks. Atlanta can clinch the 8-seed by winning three of their last six games, but the Knicks' show-runners should still find a way to make the ending hilariously depressing. Watchability (out of five stars): 4 stars. Entertainment comes in all forms, after all. Plot summary: The last two seeds in the Western Conference are up for grabs. Dallas is up a half game over Phoenix for the 7-seed, and Phoenix is up one game over Memphis for the 8-seed. following the rule of thirds: The Suns, Grizzlies and Mavericks have all proven capable of playing great basketball, and now it just boils down to preferred aesthetics. Like young, upstart teams oozing with athleticism? The Suns are for you. Want something a little grittier and less pretty? Go with the Grizzlies. How about an unstoppable star in the twilight of his career leading a group of veterans? That's the Mavericks. There's something for everyone here. Spoiler alert: You'll get to compare all three teams head-to-head, as they'll each play one another during the season's final nine days. Memphis owns the tiebreaker over Phoenix. Phoenix and Dallas are tied at 1-1 in the head-to-head series, but have a matchup left on the schedule. This should all come down to the wire. Watchability (out of five stars): 5 stars. It's like the playoffs are starting early. There's something on the line with only two spots available (barring a collapse from 6-seed Golden State), and we aren't far removed from some big upsets taking place out West in the playoffs. These three teams will get the attention down the stretch, and deservedly so. Plot summary: Twelve teams have clinched playoff berths, but there's potential for things to get wacky with so little established in terms of seeding and matchups. dance competitions: While no one will come out and admit it, the end of the season is largely a scramble to identify the partner you want to square off with. Basketball with a Sadie Hawkins dance twist, if you will. Spoiler alert: A whole lot is probably going to change in the last nine days of the regular season. Among Western Conference teams, the Rockets (4-seed) and Blazers (5-seed) are both battling for first-round home-court advantage, while the Thunder (2-seed) and Clippers (3-seed) will do the same for the second round. In the Eastern Conference, the Raptors (3-seed) and Bulls (4-seed) have identical records and will likely jockey for position to avoid the Heat for as long as possible. The Wizards and Bobcats will scrap over the 6-seed in order to duck the Heat or Pacers. In the West, the Warriors could make a move up from the 6-seed. Heck, even Cleveland is somehow still alive for the 8-seed in the East. This could get wild. Watchability (out of five stars): 4 stars. It's always interesting to watch teams juggle matchups and try to settle the eternal debate of whether it's better to go into the postseason rolling or rested. It might be a tad early for most teams to start worrying about that yet, but that time will come soon. With just a week and a half to go in the regular season, the Milwaukee Bucks are a virtual lock to secure the best odds of winning the lottery at 25 percent. They have a three-game lead over the Philadelphia 76ers, who are five games ahead of the Orlando Magic for the second-best odds of 19.9 percent. Meanwhile, the Magic, Boston Celtics, Utah Jazz and Los Angeles Lakers are in a pretty close race for that No. 3 spot and a 15.4 percent chance of winning the lottery. The Bucks have been big Joel Embiid fans, but the team with the most injuries in the NBA this season is wary until it gets more information about his back. Andrew Wiggins and Jabari Parker are the other candidates if the Bucks land the No. 1 pick. While Parker may be the safer pick, a combo of Wiggins and Giannis Antetokounmpo could be amazing down the road. I think their board looks like this: (1) Wiggins, (2) Parker, (3) Embiid. MIAMI -- Having grown up in Washington, D.C., I've either watched as a fan or covered the duration of Alonzo Mourning's college and professional career, from his first game as a freshman at Georgetown to his final game as a veteran with the Miami Heat. There was the rippled vein that ran alongside his temple that personified his strength and intensity. And there was the relentless effort and defiance that never allowed him to give out, give in or give up on any challenge despite some harsh circumstances on and off the court. Mourning received the highest honor of his professional career on Monday, when he was announced as a first-ballot Hall of Famer. He is a member of the 2014 class that will be inducted in Springfield, Mass., in August. In a span of 15 seasons, Mourning was a seven-time All-Star, an Olympic gold medalist and two-time NBA defensive player of the year. But Mourning is perhaps best known for overcoming a mid-career kidney transplant and returning to ultimately help the Heat win the franchise's first title in 2006. Chicago Bulls coach Tom Thibodeau recently made the case for Taj Gibson as the NBA's Sixth Man of the Year. "I think that the biggest thing for him is what he has contributed to us winning," Thibs said. "The things that he does for us are all team-oriented. He plays great defense, challenges shots, guards everybody, runs the floor hard, sets great screens, does his job." So Gibson helps his team win by doing all the little things that never show up in a box score. But how can we measure the value of running the floor hard, or making smart defensive rotations, or setting great screens? And how can we tell if Gibson has been more valuable to his team than, let's say, Clippers sixth man Jamal Crawford, who has scored more points than Gibson (18.6 versus 13.2 PPG) on a higher true shooting percentage (55.7 versus 52.8) while logging heavier minutes (30.3 versus 28.8 MPG) for a better team in a tougher conference? Today we're introducing an advanced metric that can help us out: real plus-minus (RPM). "You don't bring somebody in in the middle of the year and basically let Mike Woodson feel like he's not even part of this." --Former Knicks coach Larry Brown, taking aim at the way the Knicks brought in Phil Jackson. 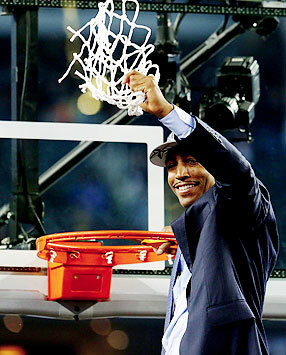 Ronald Martinez/Getty Images Kevin Ollie, whose journeyman NBA career started in 1997 in Dallas and wrapped up in 2010 in Oklahoma City, cut down the nets after leading his alma mater UConn to the NCAA title over Kentucky. Almost had to do it. Almost had to dump the Indiana Pacers out of the top 10 of ESPN.com's weekly NBA Power Rankings ... crazy as that sounds when you say it out loud. After six consecutive losses on the road, followed by that debacle of a home defeat Sunday night to Atlanta, Indy made it tough on the committee (of one) on the penultimate Power Rankings Monday of the season. We ultimately decided to keep the Pacers at No. 10 -- largely in a nod to the fact that they've been our No. 1 team this season nine times out of a possible 25 editions of the rankings -- but one more bad week will indeed knock them all the way out as we enter the playoffs. Which, to repeat, would be completely farcical given where the Pacers were as recently as March 26. How steep and sudden is this decline? According to our friends at NumberFire, Indy had an 84 percent chance to finish the season as the Eastern Conference's No. 1 seed after beating Miami at home on the aforementioned date of March 26. Now? 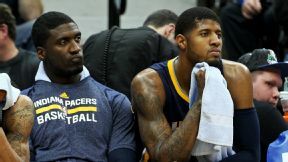 The Pacers are down to a 33 percent shot to proceed to the playoffs as the East's top team.